With the upcoming holidays – Thanksgiving, Hanukah, Christmas, New Year’s – we bet you’re thinking more about food and family gatherings than putting your home on the market. It might sound crazy but there are a few good reasons why selling your home over the holidays can be advantageous to you! Most sellers will wait for the frenzy of the spring selling season, but sometimes you don’t have a choice of when you need to move or put your home on the market. So don’t feel like you have to dread the so-called “deadbeat” time from November through January. 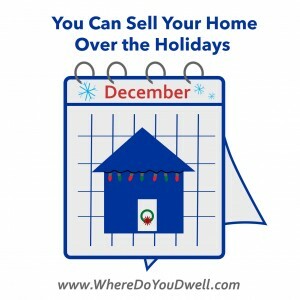 So start getting that “For Sale” sign out and prepping your home for some “Ho Ho Ho” open houses. More serious buyers who want to find a home soon. Those who are really serious about buying a home are not going to take a month off from their search during the holidays. People who are relocating for work, for example, will need to continue looking at properties and might want to get a home before the craziness of the spring. These buyers are ready to buy, and it could mean a quick and easy sale for you. Less competition and less homes on the market. Many sellers take their homes off the market or delay listing their property all together until the spring. So inventory is definitely lower this time of year. However, your home is going to stand out in real estate listings and get the attention it deserves, especially if it’s a must-see home or hot location. More cozy and cheerful in the winter. Your home probably does look its best during the holidays and why not take advantage of that. The beautiful tree, holidays lights and crackling fire in the fireplace make buyers want to stay a while. Buyers get a true sense of a neighborhood and home over the holidays. Who doesn’t want to picture their own traditions in a new home? Be flexible with showing your home. Buyers are busy this time of year so be more accommodating. Don’t overdue the decorations. Keep the clutter of décor to a minimum so that buyers can imagine your home at other times of the year too. Price your home to sell. Now isn’t the time to overprice your home and risk the chance that it will sit. There are fewer buyers and less activity out there, so you want to tap into that market not scare it away! Target buyers on a deadline. Your agent will seek out buyers who are relocating, ones who are purchasing for an end-of-the year tax reason, Capitol Hill staffers moving here post-election, or families who travel to DC metro area specifically during the holiday break to house hunt. There is a market of buyers who tend to move or look for homes during this time. Take awesome photos and a video tour of your home. Buyers may not venture outside as much to view homes and may create their must-see list after looking online. So make sure you give a good impression of your home through photos or a video tour. Let us know if you have any questions about selling your home in the upcoming months. We can help you during this time and make the holidays cheerful and bright with a home on the market.